صافی‌ شنی در تصفیه آب و فاضلاب کاربرد فراون دارد. تجمع و ته‌نشینی ذرات در بستر صافی، سبب ایجاد افت بارصافی می‌شود؛ در چنین مواقعی عموماً شستشوی فیلتر الزامی‌ است. در این پژوهش یک فیلتر تند شنی تک لایه ثقلی با محیط شن سیلیسی برای کاهش غلظت‌های متفاوت سرب به‌کار گرفته شد. مقادیر رسوب و افت بار حاصله در محیط فیلتر با استفاده از ترکیب مدل‌های کارمن- کوزنی (Karman-Cozeny)، رز و گریگوری (Rose and Gregory) در دبی‌های مختلف فیلتراسیون شبیه‌سازی شد. نتایج به‌دست امده نشان داد که بیشترین زمان در رسیدن به مقادیر متفاوت از افت فشار، در کمترین میزان ورودی غلظت فلز 25 میلی‌گرم در لیتر و بیشترین مقدار از بار سطحی 22/6 مترمکعب بر مترمربع در ساعت می‌باشد. بیشترین راندمان حذف فلز به‌میزان 92 درصد، در بار سطحی 11/3 مترمکعب بر متر مربع در ساعت و غلظت ورودی فلز 25 میلی‌گرم در لیتر حاصل شد. مقایسه زمان رسیدن به یک میزان مشخص از افت فشار، در شرایط متفاوت از دبی فیلتراسیون و غلظت ورودی فلز، نشان می‌دهد که در مقادیر کمتر افت یعنی 5 و 7 سانتی‌متر، تفاوت زمانی کمتر است. مقایسه شیب خطوط در یک دبی مشابه، برای مقادیر کمتر ورودی سرب به فیلتر، شیب بیشتری را نشان می‌دهد. Granular media including rapid gravity sand filters are used in water and wastewater treatments. When sand filters are clogged due to deposits of particles and particul-bound pollutants, it will lead to head loss and under this situation it is necessary to perform filter backwashing. Prediction of sand filter head loss is the major focus of this study. To meet the primary ojective of this study, a single-layer rapid gravity filter with sandy media was tested with inflow water containing different concentrations of lead (Pb). The amount of deposited sediments and the resulting head loss were simulated in the filter media by combination of Karman-Cozeny, Rose and Gregory equations under different discharges. The maximum time to reach the various amounts of head loss was obtained when the inflow lead concentration was lowest (25 ppm) and the surface filter leading was the highest (6.22 m3/m2/hr). The highest lead removal efficiency (92%) was obtained when the input lead concentration was 25 ppm and filter surface loading was 3.11m3/m2/hr. Comparing the specific head loss under different operating condition it has been shown that the time difference is less under lower head losses of 5 and 7 centimeters. In addition, the slopes of filtration discharge under similar operating condition showed to be steeper verifying a higher filtration performance when the concentration of input lead and filter surface loading was lower. Banejad, H., Pirtaj Hamedany, R. & Daneshi, N., 2010, "Evaluate of head loss, sediment value and iron removal in rapid sand filter", Journal of American Science, 6(12), 1218-1226. Boller, M. & Kavanaugh, M., 1995, "Particle characteristic and head loss increase in granular media filtration", Water Research, 29(4), 1139-1149. Cakmakci, M., Kinaci, C. & veBayramoglu, M., 2008, "Adaptive neuro-fuzzy modeling of head loss in iron removal with rapid sand filtration", Water Environment Research, 80, 2260-2275. Daneshi, N., Banejad, H., PirtajHamadani, R., Daneshi, V. & Farokhi M., 2014, "Evaluate of head loss, sediment value and copper removal in sand media (rapid sand filter) ", International Journal of Environment, 3(2), 12-22. Darby, J.L. & Lawler, D.F., 1990, "Ripening in depth filtration: Effect of particle size on removal and head loss", Environmental Science and Technology, 24(7) ,1069-1079. Daneshi, N., Banejad, H., Pirtaj Hamedany, R., Faraji, H. & Rahimpour Golroubari, V., 2009, "Removal of copper and zinc existing in water and wastewater in presence of phosphate by rapid sand filter", 33rd IAHR 2009 Congress, Water Engineering for a Sustainable, Vancouver, Canada. Ghavidel, A. & Moatar, F., 2014, "Evaluation of Pb, Zn and Ni in river basin of Anzali wetland (Case study Gvhrrvd River)", Environmental Science and Technology, 16(1), 89-96. (In Persian). Katsumata, H., Satoshi, K., Kentaro, I., Kumiko, I., Kunihiro, F., Kazuaki, M., et al., 2003, "Removal of heavy metals in rinsing wastewater from plating factory by adsorption with economical viable materials", Journal of Environmental Management, 69(2), 187-191. Kau, S.M. & Lawler, D.F., 1995, "Dynamics of deep bed filtration: Velocity, depth, and media", Journal of Environmental Engineering, 121(12), 850-859. Matteo, C., Massimo, G., Francesca, G., Mirko, D. R., Luigi B. & Mario M., 2015, "Removal of lead (II) from aqueous solutions by adsorption onto activated carbons prepared from coconut shell", Desalination and Water Treatment, 54(12),1-19. Muhammad, M. A., Ishtiaq, H. & Murtaza, M., 2004, "Sand as adsorbent for removal of zinc from industrial effluents", Electronic Journal of Environmental, Agricultural & Food Chemistry, 3(6), 792-798. 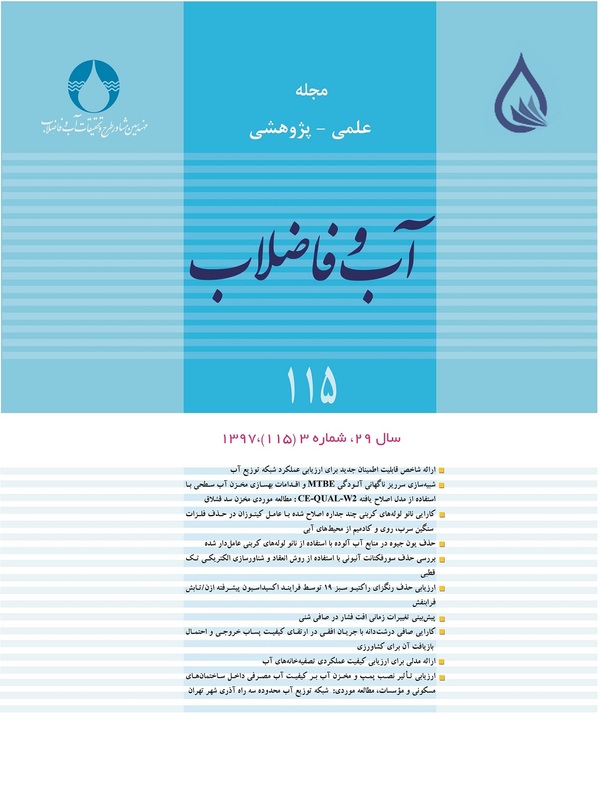 Monzavi, M., 2005, Water Supply, Tehran University Press, Tehran. (In Persian). Mokari, M., Banejad, H. & Mosaddeghi, M., 2010, "Effect of filtration velocity and rapid sand filter bed depth on removal efficiency of suspended particles", Journal of Water and Wastewater, 22 (2), 31-38. Naddafi, K., Vaezi, F., Farzadkia, M. & Kimiaeitalab, A. R., 2005, "Study of aerated lagoons in treating industrial effluent from industrial Bou-ali zone in Hamedan", Journal of Water and Weastewater, 16 (2), 47-53. (In Persian). Paulchen, J. & Xiaoyuan, W., 2000, "Removing copper, zinc, and lead ion by granular activated carbon in pretreated fixed-bed columns", Separation and Purification Technology,19 (1), 57-67. Sarioglu, M., Atay, A. & Cebeci, Y., 2005, "Removal of copper from aqueous solutions by phosphate rock", Desalination ,181, 303-311. Wang, Z., Liu, G., Zheng, H., Li, F., Haongo, H., Guo, W., et al., 2015, "Investigating the mechanisms of biochar’s removal of lead from solution", Bioresource Technology, 177, 308-317. Yu-Ting, Z., Hua-Li, N., Christopher, B. W., Zhi-Yan, H. & Li-Min, Z., 2009, "Removal of Cu2+ from aqueous solution by chitosan-coated magnetic nanoparticles modi.ed withά -ketoglutaric acid", Journal of Colloid and Interface Science, 330, 29-37. Yabe, M.J.S. & Oliveira, E., 2003, "Heavy metals removal in industrial effluents by sequential adsorbent treatment", Advances in Environmental Research, 7, 263-272.